For other uses, see Amaretto (disambiguation). Not to be confused with Amoretto. Amaretto (Italian for "a little bitter") is a sweet, almond-flavoured, Italian liqueur associated with Saronno, Italy. Various commercial brands are made from a base of apricot pits, almonds, or both. Amaretto serves a variety of culinary uses, can be drunk by itself, and is added to other beverages to create several popular mixed drinks, as well as to coffee. The name amaretto originated as a diminutive of the Italian word amaro, meaning "bitter", which references the distinctive flavour lent by the mandorla amara (the bitter almond) or by the drupe kernel. However, the bitterness is not unpalatable, and sweeteners—and sometimes sweet almonds—enhance the flavour in the final products. Thus one can interpret the liqueur's name as a description of the taste as "a little bitter". Conflation of amaro ("bitter") and amore ("love") has led to associations with romance. One should not confuse amaretto with amaro, a different family of Italian liqueurs that, while also sweetened, have a stronger bitter flavour deriving from herbs. In 1525, a Saronno church commissioned artist Bernardino Luini, one of Leonardo da Vinci's pupils, to paint their sanctuary with frescoes. As the church was dedicated to the Virgin Mary, Luini needed to depict the Madonna, but was in need of a model. He found his inspiration in a young widowed innkeeper, who became his model and (in most versions) lover. Out of gratitude and affection, the woman wished to give him a gift. Her simple means did not permit much, so she steeped apricot kernels in brandy and presented the resulting concoction to a touched Luini. The Disaronno Originale rectangular bottle, which was marketed as an amaretto until 2001. Disaronno Originale (28% abv) has a characteristic bittersweet almond taste (although it contains no almonds or nuts) and is known for its distinctive appearance. Disaronno has been in commercial production since about 1900. It claims its "originale" amaretto's "secret formula" is unchanged from 1525, and claims the Luini tale as its own particular history. Its production remains in Saronno, but the product is sold worldwide. The product was originally named "Amaretto di Saronno Originale" (Original Amaretto from Saronno). 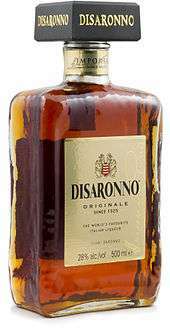 It subsequently changed to "Amaretto Disaronno", transforming the origin of the product into a more distinctive brand name. Finally, it changed once more to "Disaronno Originale"; it has not marketed itself as an "amaretto" since 2001. According to the Disaronno website, their amaretto contains no almonds, and is nut-free. Therefore, it is safe for people with nut or related allergies. Lazzaroni Amaretto (24% abv), produced by Paolo Lazzaroni & Figli S.p.A., also presents itself as the first such liqueur. It is based on an infusion of Amaretti di Saronno (macaroons), a process which imparts a "delicate almond/apricot flavour". Lazzaroni claim the tale of the young couple blessed by the bishop as the origin of their generations-guarded family recipe, dating it to 1718; the amaretto has been in production since 1851. Many distillers produce their own brand of amaretto. Among them are Bols, DeKuyper, Hiram Walker, Luxardo, Mr. Boston, Paramount, and Phillips. Amaretto serves a variety of culinary uses. Amaretto is added to desserts, including ice cream, which enhances the flavour of the dessert with almonds and complements chocolate. Tiramisu, a popular Italian cake, is often flavoured with either real amaretto or alcohol-free amaretto aroma. Savoury recipes which call for it usually focus on meat, such as chicken. A few shots of amaretto can be added to pancake batter for a richer flavour. Amaretto is often added to almondine sauce for fish and vegetables. Amaretto is often added to whipped cream. Amaretto may be served neat (by itself) or on ice. 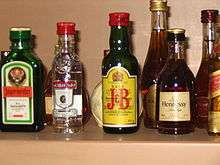 It is often added to other beverages to create several popular mixed drinks. It is also a popular choice of liqueur to add to coffee in the morning. The following cocktails highlight Amaretto liqueur as a primary ingredient. Godfather. Ingredients: Amaretto liqueur, Scotch and ice cubes. Godmother. Ingredients: Amaretto liqueur, Vodka and ice cubes. Godchild. Ingredients: Amaretto liqueur, Cream and ice cubes. Hurricane Jenny. Ingredients: Amaretto liqueur, Soda such as 7-up, Sprite or Sierra Mist and ice cubes. Toasted Almond. Ingredients: Amaretto liqueur, Kahlúa, cream and ice cubes. Bocce Ball/Almond Tree. Ingredients: Amaretto liqueur, orange juice, club soda and ice cubes. Cuban Breeze. Ingredients: Amaretto liqueur, Vodka, pineapple juice and ice cubes. Lounge Lizard. Ingredients: Amaretto liqueur, dark rum, cola and ice cubes. Amaretto Sour. Ingredients: Amaretto liqueur, lemon juice and ice cubes. Twilight Amaretto Sour. Ingredients: Amaretto liqueur, bourbon whiskey, lemon-lime soda, lemon juice, and sugar. Snickerdoodle Cookie Martini. Ingredients: Amaretto liqueur, cinnamon liqueur, and cinnamon vodka. Nutcracker Martini. Ingredients: Amaretto liqueur, dark crème de cacao, vodka, and Irish cream. Amaretto Sour variant. Ingredients: Amaretto liqueur, egg white, cask strength bourbon, lemon juice, and simple syrup. Shake and pour over ice. Amaretto Piña Colada. Ingredients: Amaretto liqueur, light rum, coconut milk, pineapple juice, and ice cubes. Amaretto Stone Sour. Ingredients: Amaretto liqueur, orange juice, and sour mix. Amaretto is sometimes used as a substitute for Orgeat Syrup in places where the syrup cannot be found, or just to impart a less sweet flavour. This is a common practice in UK bars when serving Mai Tais. Amaretto can be added to ice cream. ↑ "GOZIO Amaretto Almond Liqueur". AHardy USA Ltd. Archived from the original on July 12, 2012. Retrieved October 18, 2010. ↑ Hopkins, Kate. "Almonds: Who Really Cares?" (August 28, 2004). Accidental Hedonist. Retrieved January 1, 2007. ↑ Harper, Douglas. "Amaretto". Online Etymology Dictionary. Retrieved January 1, 2007. ↑ foodnetwork.ca. "A Brief History of Amaretto". Shaw Media Inc. Retrieved December 30, 2011. ↑ Product description. Lazzaroni Amaretto. Heaven Hill Distilleries. Retrieved January 1, 2007. ↑ "Twilight Amaretto Sour". Retrieved January 2, 2016. ↑ "Snickerdoodle Cookie Martini". Retrieved January 2, 2016. ↑ "DeKuyper Nutcracker Martini". Retrieved January 2, 2016. ↑ Morgenthaler, Jeffrey. "I Make the Best Amaretto Sour in the World". Retrieved December 12, 2013. ↑ "Amaretto Pina Colada". Retrieved January 2, 2016. ↑ "Amaretto Stone Sour recipe". Retrieved January 2, 2016. ↑ "Amaretto Stone Sour Recipe - Food.com". Retrieved August 3, 2016. ↑ "Amaretto Stone Sour Drink Recipe | DeKuyperUSA". Retrieved August 3, 2016.